Part 1: How to Craft the Perfect Offer for a Webinar Attendee: Not every offer is a good offer for a webinar. In this section you'll learn how to create the perfect offer for your webinar attendees so that you maximize your sales. 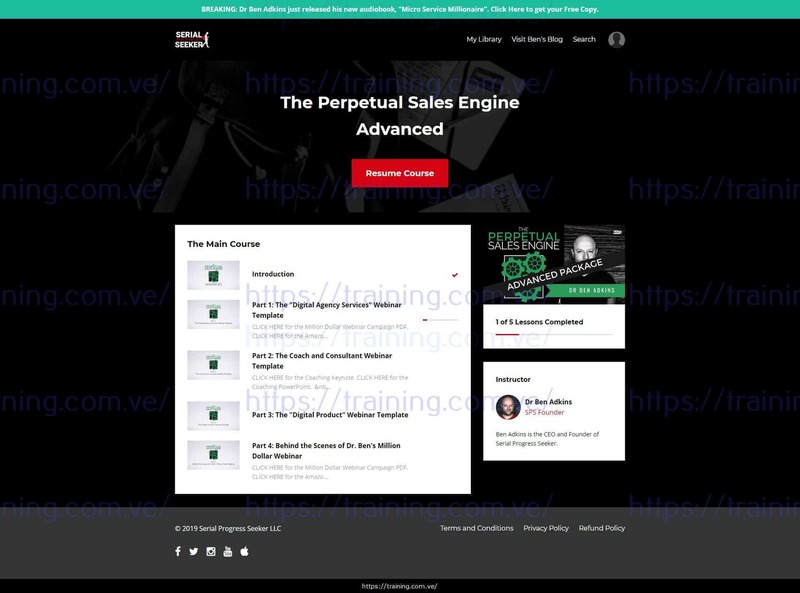 Part 2: Dr Ben's Million Dollar Webinar Template: You're getting access to the webinar creation template that has made millions of dollars in sales for Dr Ben Adkins. You'll get the full slide deck and you'll get a behind the scenes walkthrough of all of the unique conversion driving psychology that is built into it. Part 3: Webinar Delivery Secrets: Never given a webinar before? Don't worry. This section will walk you through Dr Ben's "Presenting at 100% Fast" technique that you can use to become a pro presenter quickly. You'll learn exactly how to present during a webinar and the mindset tricks that you can use to get people extremely engaged with your delivery. Part 4: The Evergreen Webinar Tech Stack Walkthrough: We want your webinar to be something that is being delivered every hour of every day on autopilot. I'll show you the exact software and tech setup that you can use to get everything up and automated in hours. Part 5: Dr Ben's Evergreen Webinar FB Ad System: Once you get your webinar setup, it's time to drive traffic to it. Inside this section, you'll learn exactly how to drive targeted traffic and minimize your ad cost with a proven template. Part 6: The Evergreen Webinar Email Followup Campaign Template: After your webinar is over, you're going to want to follow up with attendees to make sure they watched the call and saw the important parts. In this section, you'll get access to the template that we use to do just that (and an explanation of how it works). [Advanced Only] Behind the Scenes of Dr Ben's Million Dollar Webinar: Go behind the scenes and watch the exact webinar that Ben used to close over a million dollars in sales in just 7 Days.